This time, it really is all over. The arrival of Yuri Firsov, the last competitor still at sea, let the curtain fall on the Mini Transat îles de Guadeloupe. Of course, there will still be some more backstage encounters and stories to be told for the umpteenth time, as well as disappointments to digest and triumphs to savour, but the Mini Transat 2015 has indeed left the front of the stage ... that is, until 2017. Whichever way you look at it, this Mini Transat îles de Guadeloupe is about many records. First, the speed​​-records. Up to this point, the fastest sailor on a similar journey was Sébastien Magnen in 1999, who crossed from Concarneau to Guadeloupe in 24 days and 15 hours. In comparison, Frédéric Denis travelled the 4,020 miles separating Douarnenez and Pointe-à-Pitre in 19 days and 23 hours. This was an average of 8.4 knots over the entire route. Sébastien Magnen was credited in 1999 with a speed of 6.8 knots, while the fastest on the Mini Transat to date was Yves Le Blévec. who crossed from La Rochelle to Salvador de Bahia at an average speed of 7.55 knots. Another shattered record was the record for the distance sailed in 24 hours in the production boats. Aboard his Ofcet, Novintiss, Julien Pulvé broke Xavier Macaire’s previous record (272.6 miles) with a new record of 278.7 miles. He set an average of 11.6 knots from point to point. In this domain, it is clear that the appearance of Ofcet and Pogo 3 marks a real break with the old production boats. The powerful hull inspired by David Raison’s approach on his Magnum prototype, works its magic when the wind blows hard. The beautiful fight put up by Tanguy Le Turquais’ Argo (Terreal) and Edward Golbery (Les Enfants du Canal) on his Pogo 2, can’t hide the fact that it will be increasingly difficult to get a result without a new production boat with broad shoulders and flat nose. The final significant result : only two sailors needed external assistance due to damage : Gilles Avril in the first stage and Radek Kowalczyk in the second. All the other sailors managed to get into port on their own. After a distress call from the Polish navigator, Sebastian Pébelier immediately turned around, went back upwind to find Calbud that was threatening to sink and then remained alongside his colleague helping until others could come to his rescue. Of course, the jury should allow him to re-claim the time lost, in recognition of the skilll and speed with which the skipper of Mademoiselle Iodée responded. The Mini Transat is not just about performance. To cross the Atlantic at those speeds on a 6.5 metre sailboat, the sailors have to know how to live through permanent discomfort, the all-pervading damp and cuts and bruises which are, happily, often inconsequential, but also reflect the harsh conditions life on board. During the first hours of the day when the sun is still in the east and is hitting the back of the boat, they need to choose between Scylla and Charybdis : to remain on deck with maximum protection to avoid the risk of sunstroke or take refuge in the shade inside, which can quickly turn into oven. Small wounds become infected and quickly get worse on contact with sea water, as proven by a quick look at the sailors’ hands. A good disinfectant and a tube of ointment are part of the essential on-board pharmacy, not to mention the good waterproof plasters. The neck, wrists, ankles are particularly vulnerable to irritation. Helming in permanent dampness is not the best way to keep your skin baby-soft. There is no ideal solution, although specially adapted cushions can partly prevent the worst evils. However, many competitors admitted to not being able to sit down sometimes. The best solution is to sail standing up and stark naked, with hands holding on the deck, and trusting the autopilot to steer. These small miseries of daily life may seem unimportant compared to the sailor’s performance, but they are an important factor in the sailor’s levels of tiredness and morale. Is it any wonder that after that, they need to go through a decompression chamber before resuming a "normal" life ? At Pointe-à-Pitre, the Mini-ists slowly get up to speed. 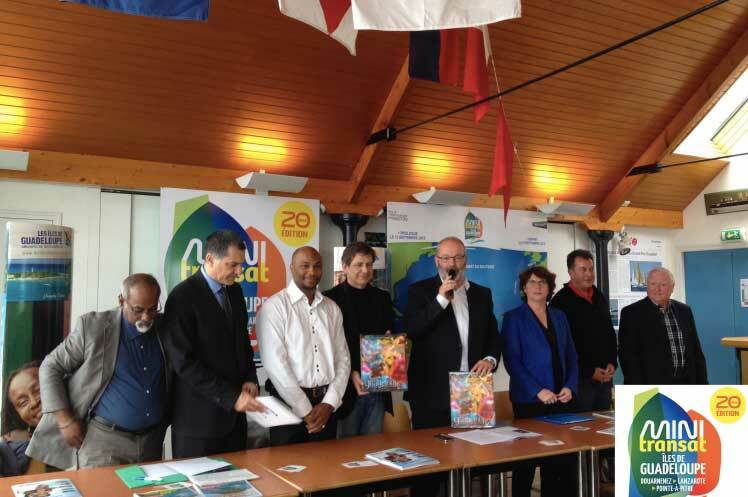 Next Tuesday, Carl Chipotel has invited the whole community of the Mini Transat îles de Guadeloupe to his home for a proper Guadeloupean day in St. Anne, to bring to a close this great story which began nearly two months ago on the jetties of Port Rhu in Douarnenez. #MiniTransat2015 : Frédéric Denis : "It still hasn’t sunk in that I have won the Mini Transat"